SPLOST VII's $22 million for a new library and parks and rec goes about 2/3 for the library and 1/3 for parks and rec, and the latter doesn't all go to parks and rec at Five Points, according to a mysterious red-letter note that has sprung up on the Lowndes County website. Can somebody explain why the new library and Parks and Rec were lumped together in the first place? At least the county is sort of trying to explain the difference now. They didn't include the pie chart with their clarification. 5 minutes to modify the old one and put it on the web. Somebody might want to check my arithmetic. By splitting parks and rec from the library as the county has noted, I came up with $9.35 million Parks and Rec total and $33.845 million total for buildings in SPLOST VII. When Lowndes County wants people to know something, why can't it put a signed and dated press release with contact information on its website? Here's a press release How-To, one of many only a google away. And send that PR to interested news media? And maybe link that PR into a County Clerk's blog? Or a county facebook page? Or twitter? Or all of the above? 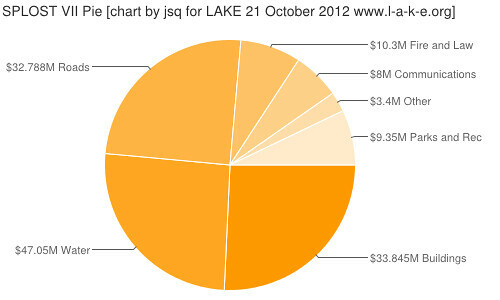 PS: There's a collection of SPLOST VII documents and pie charts on the LAKE website.